Thinking I’d earn Mom points for taking her to a noodle house, we headed into Portland one recent Friday night to try Mi Sen Noodle Bar. It is a cute place, with nice decor and a serene atmosphere. But, one thing it is not, is a Japanese noodle house. My husband said I should have known by the name, and he is probably right, but I was focused only on the “noodle bar” part. While it does serve udon noodles, it is Thai based which gives their dishes a different flavor. Clearly, instead of googling nipponophile, I should have spent more time looking up “Japanese” noodle houses in Portland, Maine. But, still she was going to get udon noodles so all was not lost. I probably should clarify that while she loves Japanese noodle soup, she really orders chicken noodle soup with udon noodles. As soon as you start adding too much to the bowl, it becomes an issue for her. We started the meal with the steamed dumpling appetizer which were a big hit with everyone at the table. They were nice, light and flavorful. We also ordered the crab rangoon. They forgot to bring them before our meal, but after a quick check, they brought them out with our soups which was fine. They were fantastic. Crab rangoon is one of my favorites so I’m a bit biased, but they were wonderful and you could really taste the crab. We each ordered a noodle dish. My husband and our udon noodle girl got the num daeng while our other daughter ordered the dry noodles. I went for something with a little kick and chose the tom yum num sai. We hit about fifty percent on liking our meals but I really don’t think that was because of the restaurant. It was the fact that expectations were not set properly. I blame google. But, even if the meal was not perfect, it was a fun family dinner outing and I would recommend the restaurant. Just remember it’s a Thai Noodle Bar! Oh! I have a nipponophile in my house too 🙂 Had never heard of that word before. Thanks for sharing. Somebody’s going to love this new cool word at my place. Great post! Dishes look really mouth watering. The food really was great. You can’t go wrong with noodles. Now I’m craving Thai food, though I thought I’d be craving Udon when I saw your title. 🙂 I love both. Sorry you didn’t get what you wanted, but sounds like you made the best of it and had a good time anyway. It was a fun family outing even if it wasn’t exactly what everyone was expecting. Still delicious! Glad you were able to make a nice family dinner out of a non-Japanese experience. I give you mom points for trying 🙂 Thanks for stopping by my blog! It was a nice night out and the food really was good. Oooh. The food looks mouth-watering…and delicious. Not sure when last I ate Thai food. I’ve tasted Thai Green Chicken Curry which was really good.I think one of the ingredients was coconut. I’ve never tasted Japanese food. My husband really liked the Thai food. He picked a dish that included brown sugar and it was quite tasty. Yum! I was in Portland a couple of years ago for a work event. Wish I’d had more time to check out the restaurants because our hosts said it was a foodie paradise. Great post! It really is an amazing food destination. Hopefully, you’ll get to come back some day. Now I’m hungry. Glad you had a good time and the food was delicious. Most of my noodle knowledge comes from watching the anime Naruto. My daughter watches a lot of anime. I’ll have to ask her if she’s seen Naruto. It was yummy. Thank you for visiting my blog too. I’m having fun with the A to Z Challenge. You’re lucky – my other half isn’t keen on Japanese food so I rarely get the chance to eat it. I’m a bit of a picky eater although I’ve gotten a lot better. My husband loves everything. Sounds yummy, even if it wasn’t exactly what you were expecting! Yes, even though it wasn’t what we expected, it was a lovely restaurant and I would definitely go back. I’ve known several people who became nipponophiles after exposure to anime. Yes, anime does have an impact. It wasn’t as popular when I was young although I do remember many happy viewings of Speed Racer. I grew up in the 1960s, watching occasional Japanese imports like Astro Boy and Kimba, the White Lion on the UHF channels. I’m so glad! 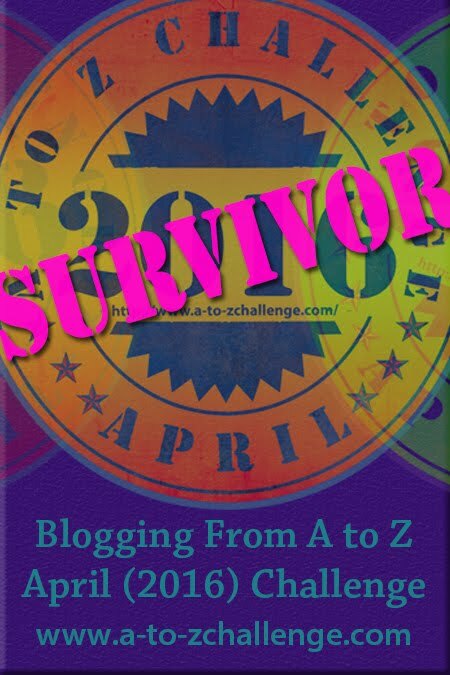 Thank you for your support during the A to Z Challenge. It is amazing to see the number of new places to eat in Portland. In the mid 1990’s it was hard to find anything beyond seafood (I still loved Portland then). Being a huge Japanese food fan I’ll remember Mi Sen Noodle Bar for my next upcoming trip to Maine. Good luck for the last five letters. The food scene in Portland has just exploded. There are so many amazing restaurants. I love heading into Portland. I’ve never been to a noodle bar, but it’s on my list of places to go. I can’t say that I’ll make it into Portland, but I’m sure we have some in Texas, somewhere. Yes, I think noodle bars are becoming much more common and I’m sure there must be some in Texas. I was down in Austin recently for the first time. Fun city. I’ve never had udon noodles. Japanese food is not a thing around here. We do have a couple of decent Thai restaurants, though. I like pad thai. As for noodle soup, my favorite is Vietnamese pho. Can’t get that here, either, but my daughter and I get it in a city a little over an hour from here, plus we get it annually at this ginormous Vietnamese Catholic festival in a neighboring town. My girlfriend loves Vietnamese noodle soup. We are really lucky with the restaurant scene in Portland. There are so many great choices.